The Unified Police Department is actively involved in Riverton Community events to promote: Public security and safety, crime reduction and prevention, citizen awareness & community involvement. Riverton City residents have enjoyed a wonderful relationship with the Unified Police Department (formerly the Sheriff's Office) for more than 30 years. The UPD has served as the City's Police Department since 1980. During this tenure its leadership and supervision shared responsibilities with the entire Southwest area in an effort to save some additional costs. But Riverton has grown tremendously over the years and recent growth required more strategic staffing. Riverton City became a stand alone Precinct in August of 2007. Additional officers were added at this time and others have been added since. 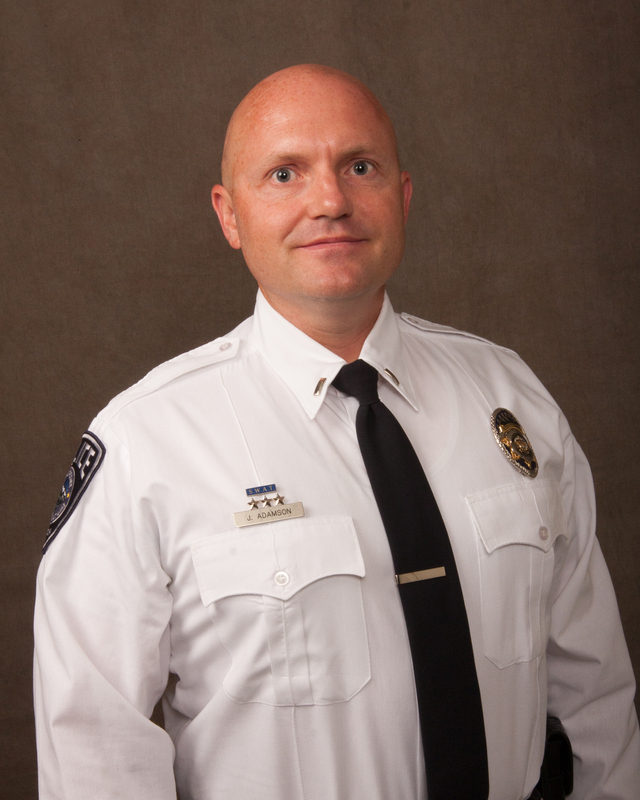 The Precinct is currently staffed at 31 full-time employees, and includes a School Resource Officer at Riverton High, Middle School Resource Officer a DARE Officer for the elementary schools. On January 1, 2010 the Sheriff's Office law enforcement deputies transitioned into the newly formed Unified Police Department; the same officers, same great service, but new colors and branding. The benefit to you in the community is that the city no longer contracts with another municipal entity. Riverton City is now a member partner of the UPD. As such, the Mayor sits on the UPD Board and has direct oversight on important issues such as budget, policy and administration. This is an excellent model for effective policing, resource sharing, and cost-effective law enforcement that will serve citizens well into the future. One of our major objectives is to build a model that is responsive to Riverton's specific needs and to truly provide all the same service that self providing could offer but with more resources and greater expertise at a better cost. With full service staffing we are able to be more involved at the community level in problem solving and other priority issues such as juvenile drug and alcohol problems. We are also working with City staff to coordinate and improve traffic safety efforts in our neighborhoods and on our thoroughfares. Riverton City residents have enjoyed a wonderful relationship with the Salt Lake County Sheriff’s Office now Unified Police Department for more than 30 years. The Sheriff’s Office and UPD has served as the City’s Police Department since 1980. Traffic Enforcement (parking, stop signs, etc); Any Traffic or Roads related calls or issues. Traffic School –for the courts and for community groups. Motorcycle – for strategic enforcement; high profile events and to coordinate with Motors Unit! News articles, Newsletters, bulletins, Website pages on Traffic, regular updates, links, comment page, stats, etc. 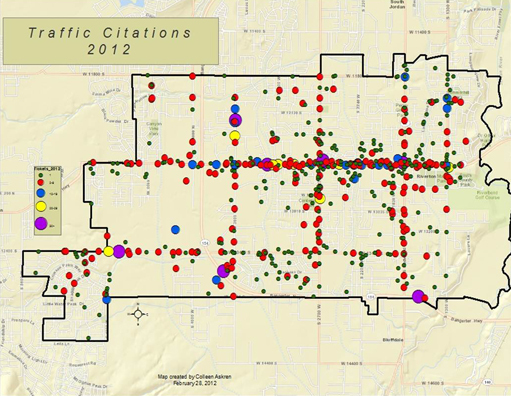 See the maps below for data on annual traffic citations and accidents in Riverton. A UPD Dispatcher will take your preliminary infomation. A UPD Officer will be dispatched to contact you All calls are prioritized and dispatched accordingly. Afterhours, weekends and holidays contact an officer through Dispatch. To request general speed enforcement at a specific location contact the Riverton Precinct station: 385.468.9400. A Riverton Precinct traffic enforcement officer will assess the location for violation frequency. If warranted various methods of traffic calming can be implemented including more frequent enforcement, temporary placement of a speed radar trailer, permanent placement of stop signs or speed radar signs, more extensive speed studies, and speed controls or other engineered road calming. Speeding is the most frequently mentioned problem affecting the community as a whole. Most speed complaints come from your neighbors inside residential neighborhoods. You can help by being considerate of your neighbors and watching your speed as you travel along residential roads. Be especially mindful of children and bicycles. 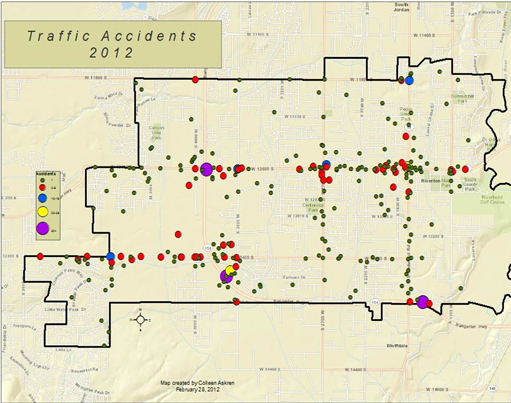 For other traffic problems, contact UPD dispatch: 801.743.7000. Suspicious activity may indicate a problem is brewing. As citizens within the community, you are the eyes and ears of your police force. If you don't report it, we may never know about it. Graffiti and "tagging" is an unsightlly defacement of our communities. Remove all graffiti within 24 hours! The longer graffiti stays up the longer it's adverse affects infect us. Its like a Billboard advertising for more of the same and engourages more graffiti and other criminal activity. RIverton City is committed to the prompt removal of graffiti on Riverton properties. Please report all graffiti to the UPD. We also have some graffiti removal supplies and resources available at the Precicnt offices. No community is without the devastating curse of illegal drug use. Report suspected drug activity to the UPD. On-going activity will be investigated by Riverton Precinct C.O.P. detectives who coordinate with investigators from other agencies. Once you have provided information you should expect that the investigation will take some time and you are not likely to know its progress until it is completed. The UPD will assist Riverton residents to setup and maintain a Neighborhood Watch program to deter criminal activity in their neighborhood. Contact the Riverton Precinct C.O.P. officer for more information. Adult volunteers help local schools with safe passage of students walking to and from school. The UPD will assist local schools to implement this program. Contact your local school to volunteer. School principals may contact the Riverton Precinct C.O.P. officer for program assistance. Adult volunteers help local schools with crowded traffic issues during drop off and pick up times. The UPD will assist local schools to implement this progam. Contact your local school to volunteer. School principals may contact the Riverton Precinct C.O.P. officer for program assistance. Paid employees managed by the UPD ensure safe crossing of students during specific hours at school crosswalks and intersections. Contact the crossing-guard supervising Officer, 801-743-5682, for details. Adult volunteers help represent the UPD at booths in local community events, assist with crime prevention programs, conduct surveys, and provide community input to the UPD. Contact the Riverton Precinct C.O.P. officer for more information on how you can participate. Young men and women ages 16 to 21 participate in a Boy Scouts of America Explorer program to provide youth with an introduction to law enforcement work. Interested candidates can contact a program administrator at 801-743-5954 for details. A volunteer horseback riding club which represents the UPD at community events and competitions. Posse members belong to the Utah State Western Riding Club Association (USWRCA). Contact UPD Special Operations for details. Select citizens receive hands-on instruction concerning modern law enforcement. Fall 2008 Academy has begun. If interested in attending a future academy session contact the Riverton Precinct C.O.P. officer. Reimplementation of this program of volunteer officers is under development. Contact UPD Special Operations Division for details on how to become a Reserve Officer. What Services Does The UPD Provide Riverton? The UPD employs over 420 officers and 140 Civilians throughout Salt Lake County. Many of our Unified Police and Salt Lake County Sheriff's Office employees also reside in the Riverton and Southwest area. This enhances our response capabilities and general safety for community members. All of the resources of the UPD are available to the Riverton City Precinct as needed. Many of these members also have specialized assignments providing Riverton with a wealth of knowledge, experience, and expertise. Landlord-tenant disputes, Small Claims Court & Repossessions. Riverton Precinct partners with Riverton City Parks and Recreation each year to provide a “Holiday Heroes” program for local families experiencing extraordinary difficulties during the Holidays. If you know of a family in the Riverton area that is in significant need of support for this holiday season, please complete the “Application” below and turn it in at the Riverton Precinct. For more information on this program we invite you to continue reading the News Article Riverton Holiday Heroes Program or contact the Riverton Precinct Offices during business hours. Due to the volume of requests only those applicants being considered will receive follow up contact.